I am a 51 year old Dominican lawyer presently owning/managing a retail meat and restaurant operation in Santo Domingo, Dominican Republic. I am married with 2 kids. I love to cook, and travel or just sit down with friends in front of the sea. We fell in love with the area many years ago. In 2003, we had the opportunity to find the perfect spot to build a family house that everybody loves so much, we called it "Casa Paraíso" or Paradise House. It is one of the best spots for swimming, snorkeling, walking, lounging or kite surfing. It is near the village of Las Terrenas with all its european influences in good restaurants, and markets, but far enough for it to be quiet and private. Two dining tables. One inside, one outside. Possibility of practicing kite surfing in house beach. Una casa en el paraíso! Gracias por tan lindo review! We had a lovely weekend at Paradise House. It is beautifully decorated and invites you to want to sit and enjoy every corner of the house. The kitchen is fully furnished and the staff is well trained to attend the most demanding of needs. Our big family of 15 had the most amazing weekend in this beautiful beachfront villa. We had a 5 star hotel experience!!!! I would definetely come back!!! Best house in all Las Terrenas and Portillo area! This is by far the best house and the best location which you can have at Las Terrenas. We have gone to las Terrenas many times and stayed at several properties and at different locations in the area, but Anabella's house is by far the best of all we have seen. 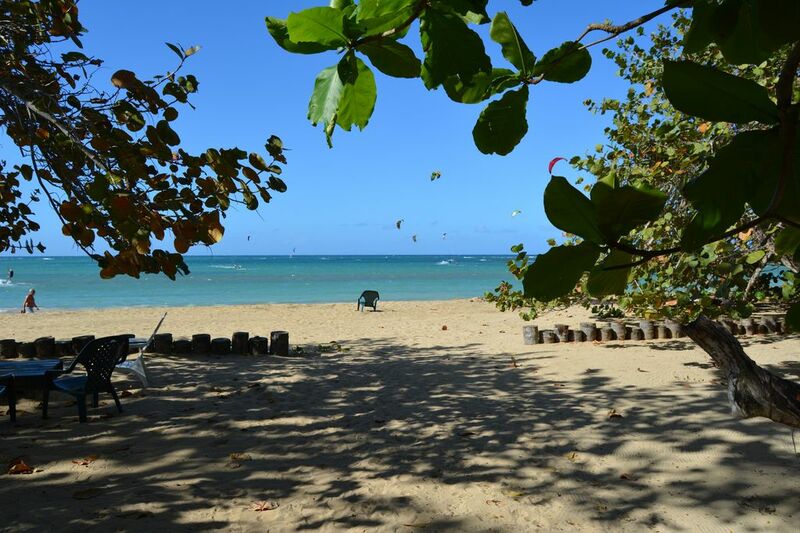 There is no better area of beach in all Las Terrenas and Portillo. When you first experience swimming in the ocean and put your feet on the sandy sea bottom behind the house, you know you have arrived in paradise. The property stands close enough to the town and yet apart from other houses, giving you that wonderful feeling of freedom and of being in a paradise all of your own. The house itself is a dream house. Beautifully decorated in a naive, yet very elegantly relaxed way. It is an eclectic decor, tropical and Caribbean, with Polynesian touches which include a portico, carved wood beams and even a stuffed or wooden Komodo dragon by the swimming pool. We went with our whole family, to celebrate my wife's birthday and we had a fabulous time. Our grandchildren enjoyed the swimming pool and the children playground area. It even includes a really superb treehouse! The staff was delightful. The cook, Gladys, made some wonderful dishes. We tried her Dominican breakfast of mangu, fried cheese and fried eggs, it's an experience! Working with Anabella was easy, straightforward and accommodating in a very pleasant way. We will return to this house, hopefully , many times in the future. It is a hidden gem! I can only brag of my families great fortune to have found this Paradise in a Paradisaical beach ! All my family grandparents, siblings, sons and daughters, son in law, in laws and granddaughter, we ALL had a great and FANTASTIC time. The house is unique , the attention to detail, the decor is beautiful and elegant, yet not to much , the disposition of the rooms is perfect. the combination of the beach and the pool was enjoyed by all , big and small! the activities in the beach , swimming, snorkeling , kite surf (great school near by) , walking is great. The location of the house is ideal, no to close to the neighboring hotels and town of Las Terrenas, but close enough so you can enjoy the activities, stores and restaurants (many close by and great), for the older crowd many restaurants and night life too! The best for last, the owner Anabella is great!! and the staff at the house are INCREDIBLE! (this sole word describes their attention to detail in all the days we where at OUR Paradise in the Dominican Republic). I will be very happy to answer any questions. Thank you to you all from the Polanco´s from Ecuador and the Kline´s from Wisconsin!